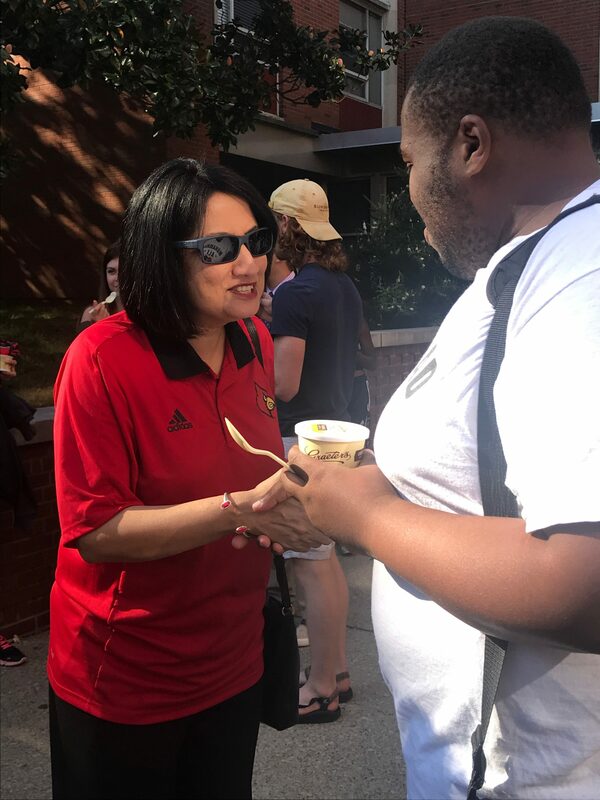 U of L Campus Housing, UPS and the Residence Hall Association put on an Ice Cream Social on Thursday where students had the opportunity to meet other freshmen and President Neeli Bendapudi. Many students flooded the Miller Hall Quad and Student Rec Center for a chance to introduce themselves and to grab free Graeter’s ice cream. With Graeter’s in one hand and her “L” up in the other, Bendapudi got to know students; shaking hands and having meaningful conversations with students and faculty members alike. “Meeting students is my favorite part. They are why I am here,” Bendapudi said when asked how she felt meeting all of the students. She went on to talk about her now 100 days as the President of the University of Louisville. “These past three months have been very good, but very hectic. We spent months preparing for the students to be back on campus, but the university feels weird without the students here. I kept checking the days to see when students would be back,” Bendapudi said. Freshman Makya Griffin appreciated how open U of L’s new president is. “I feel honored and super excited to be in the presence of such a motivated and driven President. I think it is the start of something new for the university and I do not think we could have ended up with someone better to lead the university,” Griffin said.